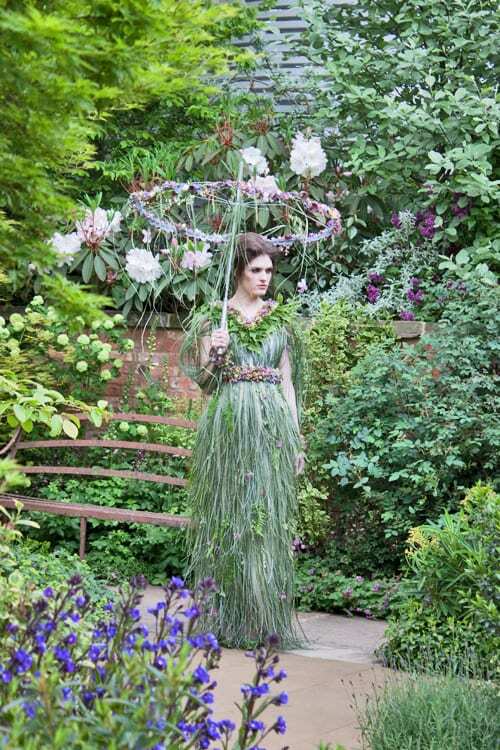 I absolutely loved the floral dress which florist Zita Elze created for Roger Platts‘ M&G Investments Centenary Garden for Press Day. 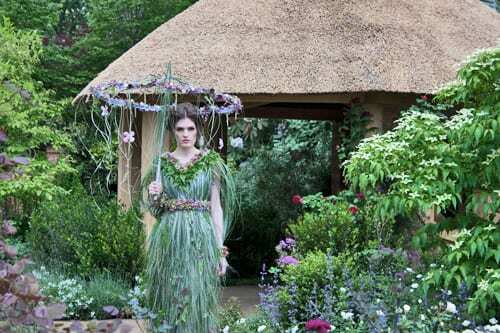 Zita made the gown in the style of a dress from 1913 to commemorate the centenary theme of the M&G show garden. At the time, dresses were layered with ruffles. 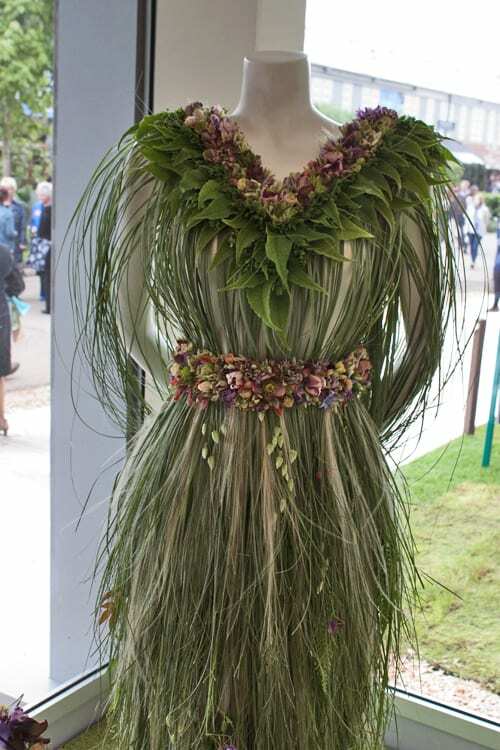 So Zita recreated them with ferns on the neckline, and on the skirt, she used layers of bear grass. 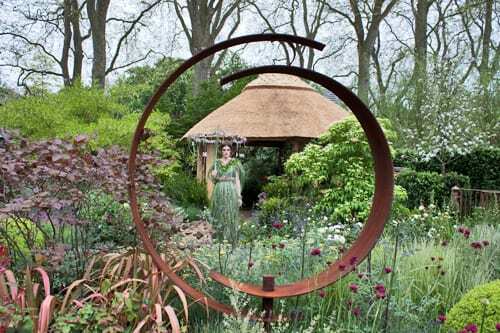 Prior to the show, Zita went to Roger Platts’ nursery to see the plants which he planned to use, so that she could be inspired and get a ‘feel’ of the garden that he would create. Whilst there, she bought many of the plants and kept them until they bloomed in time for the show. She then used them when creating the dress. Isn’t it just amazing?! So much work and detail has gone into making the design. 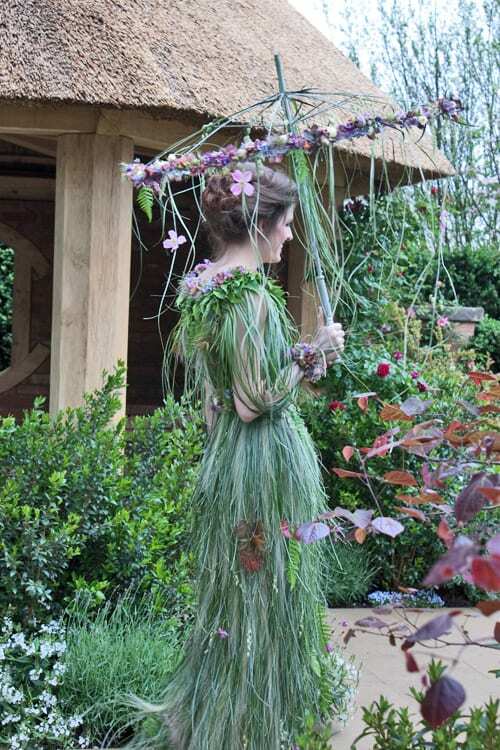 The skirt, bodice and sleeves were made using bear grass and a selection of different ferns. The sash, cuffs and neckline are pieces of floral embroidery, for which Zita is renowned. And the shoes were adorned with hydrangeas and layered ferns. Bear grass and a selection of flowers, including clematis, hellebores, rose buds, pansies and astrantia were used to create the parasol. Many congratulations to Roger on winning a Gold Medal for his show garden and also huge congratulations to Zita for creating such a floral masterpiece! 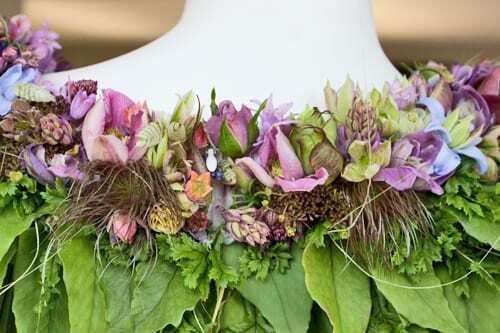 It’s a wonderful example of Zita’s celebrated ‘Living Embroidery Bridal Collection’, a range of gowns and accessories which she creates using fresh flowers and foliage. 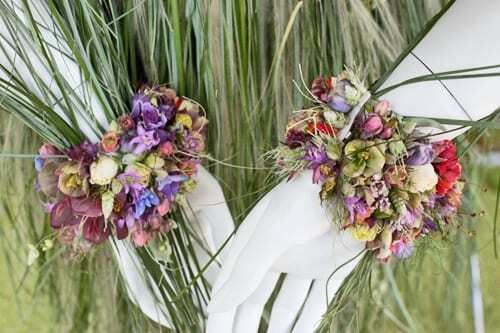 Thank you also to Lucinda at Zita Elze Flowers for all her help in compiling this blog post. If you’d like to keep up-to-date with news about Zita Elze Flowers, they’re on Twitter and Facebook.